Thames & Hudson, 9780500241455, 352pp. Even non-graphic designers know that type is everywhere: fonts and typefaces fill everything we consume or inhabit. They communicate, inform, sell, explain . . . and yet finding serendipitous letterforms in the least likely locations can also excite and inspire. Once experienced, it is impossible not to see letters in anything from forests to housing projects, from leaves to brickwork. The eye becomes accustomed to seeing a world built of letters. 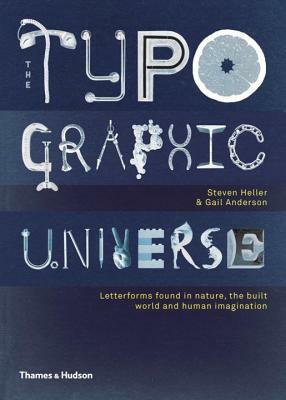 Unlike most books on typography that present the "best" and most refined examples, the object here is to reveal the "lost" or "unseen" typographies in nature and our cities. From machine-made and sculptural forms to flora and fauna, from the fading ghost types on buildings from a pre-digital age to the subterranean forms found beneath our urban centers, from crowd-sourced creations to the popular vernacular, there is a universe of letterforms all around us.